Louvers Allow Air To Flow Freely Between Rooms And Are Essential In Commercial Buildings And Applications Such As Laundry Rooms And Closets Where Consistent Air Flow Is Critical. 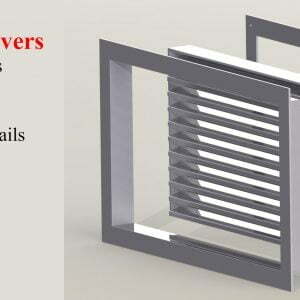 Best Brothers Group Offers A Wide Variety Of Door Vents By Air Louvers For Commercial And Residential Properties. Now With 10 Colors To Choose From For Steel Louvers, You Can Get A Stylish Louver For Any Door In Your Establishment. Not Just Any Door Vent Will Do. You Need To Consider The Type Of Room Utilizing The Door With Louvers And How That Louver Will Impact It. Since A Louver Is Used To Promote Air Flow Between Rooms, It Will Have Vented Slots. While Some Louvers Have Tightly-Spaced Slots, Others Have Very Wide Slots. At BBG We Offer A Variety Of Door Vents So That You Can Find The Right One To Suit Your Style And Functionality. Darkroom Louvers – Created Specifically For The Photo Darkroom Environment, These Door Vents Offer Limited Light Entrance To Keep Your Precious Negatives And Photographs Undisturbed While Still Promoting Healthy Airflow From Chemicals Associated With Photo Development. No Vision Louvers – No Vision Door Louvers Implement A Downward Angled Slot. That Means That No One Can See In Or Out Of The Louver Itself. Perfect For Privacy! Steel No Vision Partition Louvers – Created Specifically For Steel Doors, These Louvers Provide Your Room With The Utmost Protection From Peeping, While Still Providing Ample Airflow. Vandal Resistant Security Louvers – Vandalism Is No Longer A Concern With The Vandal-Resistant Model. Paint, Markers And Pen Will Wipe Away Quick And Easy From This Door Louver Thus Providing Your Establishment With A Vandal-Free Appearance. Our Door Vents By Air Louvers Come In 10 Color Choices At No Additional Cost. Models Are Available In Stainless Steel And Can Come With An Electro-Galvanized Finish Or Be Constructed From Galvanized Sheet Metal. These Louvers Are Perfect For Either Interior Or Exterior Use And Are Corrosion-Free. Air Louvers Is A Quality Door Louver Manufacturer Based Out Of California. Offering Wood And Hollow Metal Door Vents For Over 30 Years, Air Louvers Supplies A Complete Line Of Door Louvers All Tested And Certified By Underwriters Laboratories And Intertek Warnok Hersey. All Products Meet Fire Safety Ratings And Requirements To Surpass Safety Standards. All Air Louvers Products Are Frequently Tested And Modified To Exceed Standards. Using The Latest Techniques In Metal Forming Technology, Air Louvers Products Will Exceed Your Expectations. Custom-Sizing Is Available. Louvers Allow Air To Flow Freely Between Rooms And Essential In Commercial Buildings & Applications Such As Laundry Rooms & Closets Where Consistent Air Flow Is Critical.